Caleb grew up as the son of JV missionaries in the Czech Republic, and Haley as a pastor’s daughter in Fort Collins, Colorado. Caleb and Haley first met as young teenagers, after which a long distance friendship blossomed and their lives began to intertwine. They both had desires to serve God cross-culturally, and so pursued biblical training at Moody Bible Institute in Chicago, during which time they were married. Caleb and Haley later spent three months in Bulgaria serving with Josiah Venture as interns, where God cultivated in them a love for the Balkans. They moved back to Colorado and Caleb started working as a stonemason as they devoted themselves to their local church, all the while seeking God’s will for the future. 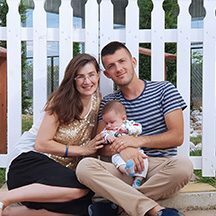 Their son, Charles was born (in August 2017) and God began opening the way for them to move to Albania with Josiah Venture to join and support a local church in reaching the city of Vlorë. Caleb and Haley, along with two Albanian couples, have a vision to see God move in the hearts and lives of Albanian youth. Their prayer is that God would use them to spark a country-wide movement of passionate followers of Christ. You can write to Caleb & Haley Patty directly from this page.